Germany's rising star Daniel Altmaier is slowly making waves on the ATP circuit having just made his second successive final. 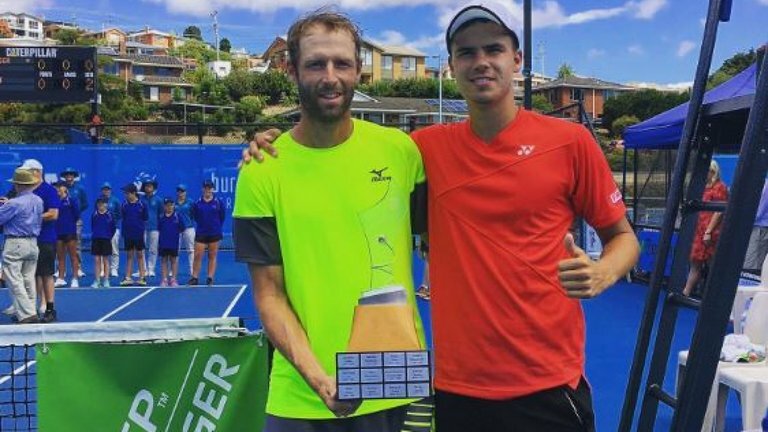 The 19-year-old Sky Sports Scholar lost a three-set thriller in a Hong Kong final on Christmas Eve and at the weekend battled his way to the Burnie Open final in Hobart. Veteran Stephane Robert may have denied him silverware in Australia, but his performances over the week Down Under suggest Altmaier's fitness is rapidly returning and a rise from his current rank of 313 is inevitable. "I'm super happy to be back on court again. After a really tough six months with injuries I really missed competing. Now I'm feeling in good shape and feel I can compete at 100 per cent. To start the year with another final at such a strong event is a really good result which I think I deserved because I put a lot work into it. The opening round in Hobart was a hard-fought close match and I came through a tight tie-breaker which set me up nicely for a solid second round in tough windy conditions. It was a very open quarter-final and I didn't have great expectations but I got through and I saved my best for the semi-final against local boy Jason Kubler. It was the highlight of my week. That was one of the toughest matches I had ever played because I knew I had to be aggressive and use my shots. I was down 2-0 in the third set and there was a crucial point in the match because my opponent was starting to take control. At that point I said to myself 'it's time to change Dan, you're not a passive player and you have to be the one who controls and goes for the shot. Let's go!'. And it was 'BOOM'. I found a great rhythm and got the job done 6-2 to win. Something in tennis you need is to have a conversation with yourself and start thinking in the present because if your mind is not right then you lose focus and concentration. I was really happy with the way I handled that situation to make it into the final. I was playing Frenchman Stephane Robert, ranked 50 two years ago, and I just couldn't get to the point where I had been in my previous matches. Physically I was just off the pace and that's not good enough at this level. I think I left a lot of energy in the previous rounds and especially in the semi-final. Robert played some great tennis and he deserved the win. Overall though, it was a great tournament and I'm now looking forward for the next challenges on tour. Next up is Launceston in Australia at the 75,000$ ATP Challenger event. I can't wait!